Last week, I made my first order on Brooks's website. I knew that I wanted a new pair of light-weight shoes for shorter distances, and I've always had great luck with Brooks in the past. Their website also has a fantastic return policy, so I figured I would just make my order there instead of making the trek to the running store. I was in luck too- the shoe that I wanted was on sale, and I found a few other things on a great sale as well! First up are the shoes I picked out. They are the PureFlow 3, which I got for $65. To put it mildly, I am in LOVE with these shoes. They were extremely comfortable from the first run I took in them. They are really lightweight, but have a lot of cushion in the heel and toe. I also love how the tongue of the shoe is attached on one side, so that it will never slip down (that is SO annoying if you're in the middle of a run and have to pull the tongue up!). I also like how the laces aren't in the exact middle of the shoe like usual. I'm not entirely sure what the scientific reason is for this, but it really makes them more comfortable. I'll try to explain how it feels-it takes some of the stress off the sides of my feet and makes them fit more snugly on my arch. Sometimes when I'm running, I'll get a numb sensation at the top of my foot and can feel the veins pulsing (TMI? ), but this alleviates some of the pressure and makes it SO much more comfortable. As you can tell, I'm loving these shoes! The other thing that I ordered from Brooks is the Utopia Thermal Hoodie III. This winter, I realized that I needed a warmer top layer. Most of my jackets are water-repellent, but not very heavy. I would end up wearing 3 to 4 layers just to keep warm outside! When I saw this hoodie/jacket, I decided to try it out since it's marketed towards cold weather. This jacket is one of the softest pieces of clothing I own. As soon as I opened the box and felt it, I immediately fell in love. The fabric is a brushed thermal cotton, so it feels like a perfectly broken-in jacket, but it's spandex so it maintains its shape. The pockets are angled, so it's easy to get things in and out of them, and they're nice and spacious. There's even a small inner pocket for your phone or gels! There's a hole in the hood for your ponytail (which I love, but Dan thinks looks silly) and thumbholes. I absolutely love having thumbholes in anything long sleeve, so this was a major plus for me! It's also extremely warm, but also breathable. Basically the perfect combination of everything! Some of the negative reviews on the jacket are regarding the design of the jacket. In the back, there is a slight "cape" effect, which some people didn't like. I personally liked the design and like how it gets a little larger and is longer in the back. Even if it makes me look a little bigger, I don't mind because it's so darn comfortable! The only problem I've found with this jacket is that the zipper seems to go down as I run. I had to keep pulling it up, which was a little annoying. If I kept it zipped almost all the way up, it seemed to stay put better, but I like to slowly unzip as I run so I stay comfortable. 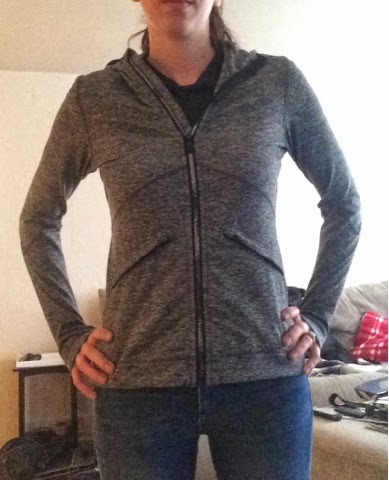 Overall, I really liked the jacket and found it to be extremely comfortable and great for running, or for errands! It's really cute and keeps me warm! I hope you liked my two (lengthy) reviews today! I liked both of these products and had great luck purchasing from Brooks's website. I also ordered a shirt that I didn't like, and had no trouble returning it. What are your current favorite shoes? What's your favorite place to buy running clothes and shoes? -In Pittsburgh, I love shopping at True Runner, but their prices are a bit too high sometimes! They run sales a lot, luckily. I have the pure flows 3 and they are probably my favorite pair of shoes I owned. I mainly only wear them for speed workouts now. I prefer elite runners for the local store because the staff is very knowledgable and they actually care about the runner and not just pushing product down your throat. I've only had good experiences at true runner! I like the staff there a lot. I also really like Kevin and support his races, but his store is a lot further away so I can't get there as easily. I'm becoming fairly loyal to New Balance. I am on my second pair of minimus zeros right now. 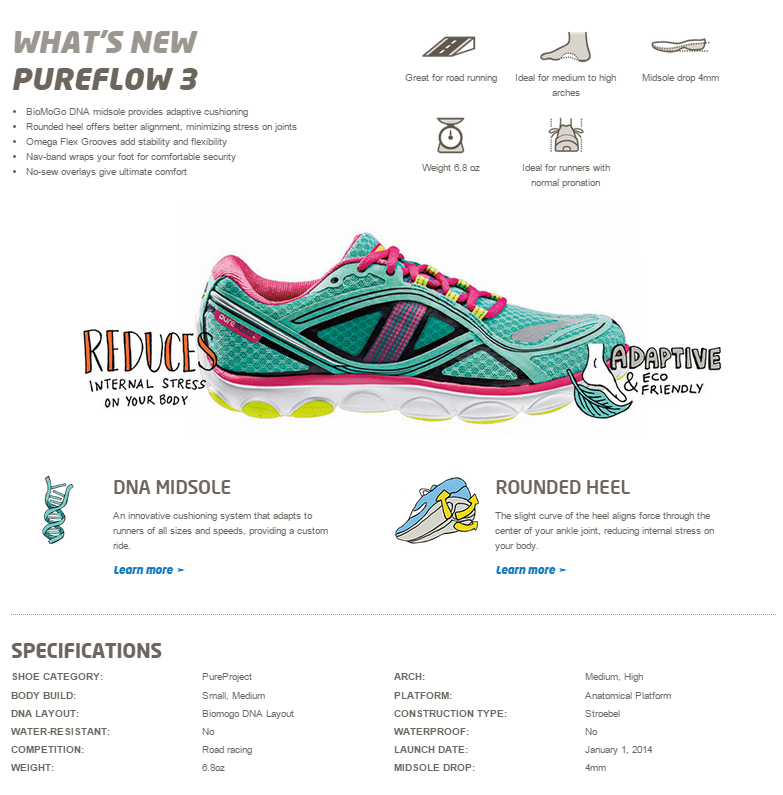 I've tried on the Brooks PureConnects a few times, but even just walking around the store I thought they felt way too sponge-y underfoot (even though they have a fairly thin sole). I am used to feeling the road. I've been looking for a new pair of trail shoes and I think I found a New Balance pair that I want to try. They just seem to fit my foot shape really well. I love new balance! I had a pair a few years ago that I loved. I may have to try them again soon! cute hoodie! i love the entire pure line, but the pure connects are my favorite shoe of all time. i'm on my 5th pair! I love brooks and this is my first time trying the pure line. I think I've been missing out! So awesome that you found a perfect match with your new shoes, especially without trying them on first! I actually like the gathered detail on the back of that jacket. I like little details on clothes like that, and it looks great on you! That hoodie looks so cute! I love soft clothing like that. It just feels so great when you put it on. 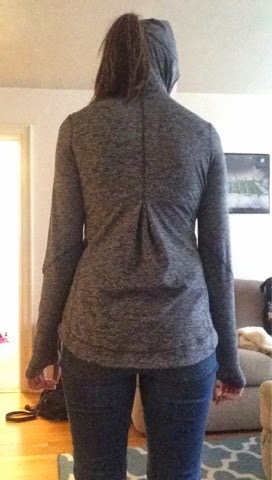 I also think that all of my tops should come with thumbholes and inner pockets. Whoever came up with those ideas was genius! Yes, seriously. I hate wearing short sleeves just because I love them so much. I used to hate them and now I can't get enough! I love Brooks--I ran in only Brooks for about 6 years. ADORE THEM. But right now I'm loving the Newtons that I am in. And thumbholes, and good pockets are always a must. One of my favorite and most cherished jackets is the one that I got for my first marathon (MCM)--by brooks, amazing cut, and hot pink!